The Black Tupelo -Nyssa sylvatica, is a large deciduous tree averaging between 30-60 feet in height, with a few recorded to reach heights of 100 feet. 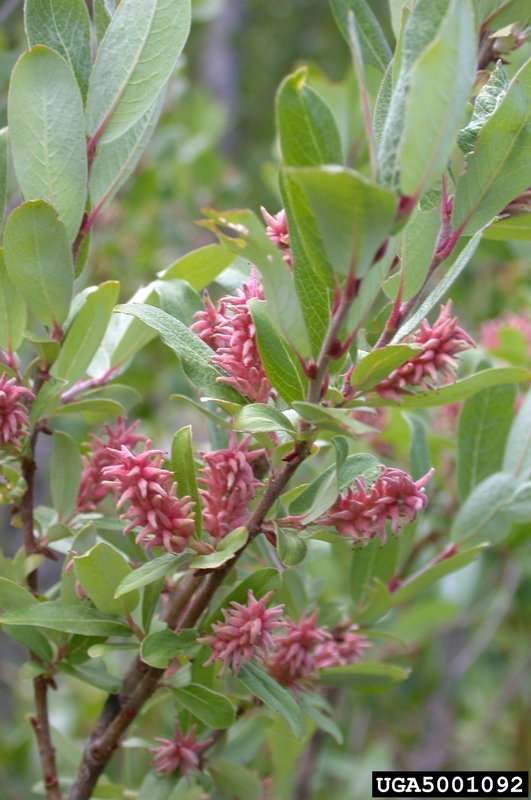 It is also commonly known as the Black Gum or the Sour Gum. The most remarkable feature of the Black Tupelo is the non-scissile grain of the wood, it is not only cross woven but inter-braided as well. The wood is almost impenetrable with an ax and can only be cut with a saw. The leaves are hard, glossy and green in color. In the Autumn the leaves change to either entirely or partially red in color. The foliage is considered to be dense, with the crown leaves growing near the ends of the laterals. The most identifiable feature of the Black Tupelo is the dark blue fruit which appear on long stalks with a single large stone on the inside. The flesh of the fruit is thin and oily, sour and bitter. The flowers appear in the early spring and fruits in the fall. The bark is a dark reddish black in color. The texture is thick and deeply furrowed in a rectangular pattern. 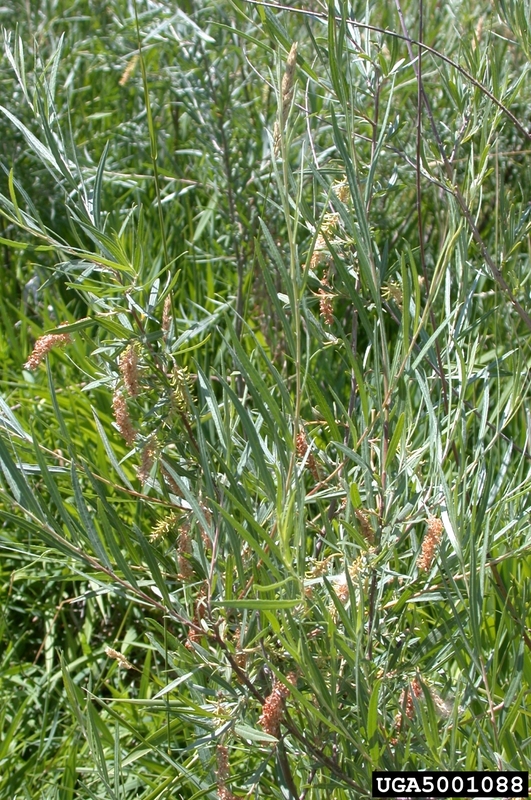 The male flowers are greenish in color, tiny in size with heads on long stalks at the base of the leaves, while the female flowers are in clusters of 2-6 appearing on separate trees. The range begins from Maine to Northern Florida in the East and West to the Northern edges of Florida and West to Northern Michigan and down through Oklahoma and Texas. It is most common on the Coastal Plains of the Northern Atlantic state and Ohio Valley. It prefers wet soils, swamp and river edges but has also been known to thrive in upland areas as well. The Ironwood which is also known as the American Hop-Hornbeam (Ostrya virginiana) is a slow growing deciduous tree with leaves resembling the Elm, though it is actually a member of the Birch (Betula) family. The Ironwood grows in a pyramidal form when young with a crown that broadens with age. The crown height is generally 15-50 feet tall with a spread of 12-30 feet. It grows best in partial shade to full sun and is recommended for hardiness zones 5-9. The leaves are simple and oval with sharp doubly serrated edges and veins that are forked at the ends. The leaves are green in color above and a lighter yellow-green below. In the fall the leaves change to a brownish-yellow, mid orange or even sometimes red color. The flowers are Monoecious, the male catkins are usually grouped in threes and are green in color. The bloom time ranges from mid to late spring. The fruit is a brownish to tan color nutlet and enclosed in a hop-like sack. The bark is a Grayish-brown color with narrow rectangular strips which are loose on each end. The bark has a shredded appearance that is very similar to the Shagbark Hickory. The wood of Ironwood is hard and durable, in fact the name Ironwood is a direct reference to the strength and durability of the wood. The wood is used for fence posts, fuel, mallets, and tool handles. The bark and inner wood layers were chewed on and made into teas to treat toothaches, sore muscles, coughs, and many other ailments by The Native Americans. The Ironwood also provides winter food for Pheasants, Grouse, Squirrel, Rabbit as well as Whitetail Deer. 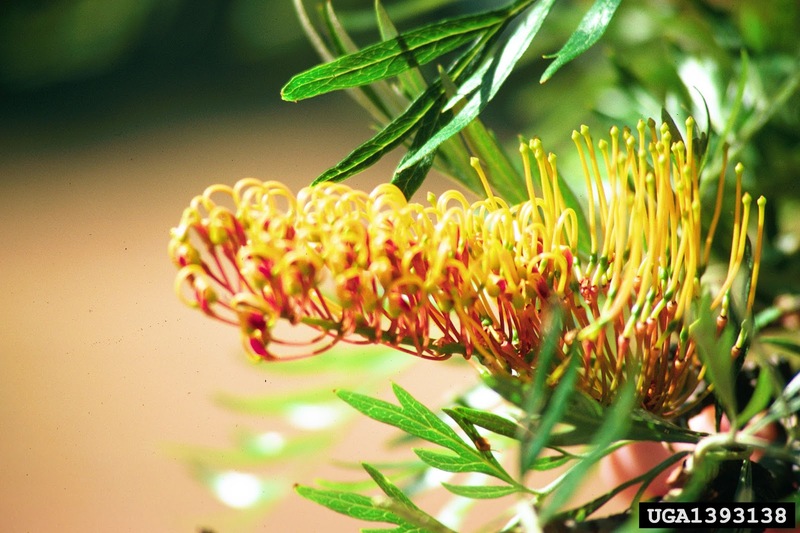 The Silkoak - Grevillea robusta is a fast growing specimen tree that reaches heights of 75 feet or more with a 25 foot spread. Growing in pyramidal to oval shape when young, which eventually develops into a few heavy horizontal limbs with one central thick trunk. Contrary to it's name the Silkoak is not a member of the Oak (Quercus) family, it is a member of the Protea (Proteaceae) family. The recommended hardiness zones for the Silkoak are 9B through 11, it is not native to North America. The leaves are light and fern-like arranged alternately. They are a grey to green in color with an almost silver shade underneath. In most climates of the hardiness zone the tree is and evergreen, retaining leaves year round. Generally the tree loses a large amount of leaves in the Spring shortly before the new growth emerges. The flowers are a very showy bright Yellow-Orange and appear in the Spring - Fall depending on the region/climate. For example in Hawaii the flowers can appear from March through October but are recorded as most showy during the Month of June. The fruit is black in color, leathery in texture and does not tend to attract wildlife. The fruit is sometimes considered a nuisance as it falls and litters the ground. It has been established as a forest tree in some countries and shows promise as a fast-growing timber tree. The Silkoak produces an attractively figured, easily worked wood, which was once a leading face veneer in world trade. When used as a veneer it is usually marketed as "lacewood". The wood contains an allergen that causes dermatitis for many people. 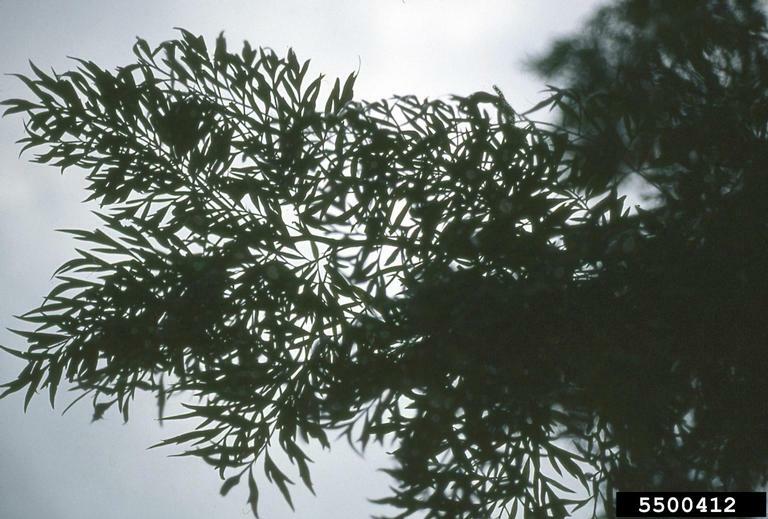 The Saw Palmetto - Serenoa repens - is the only species in the Serenoa genus. A relatively small Palm that reaches only 7-10 feet tall at maturity. 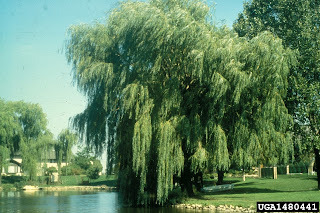 It does not often grow with straight or singular trunks, but instead grows in low lying clumps or thickets. 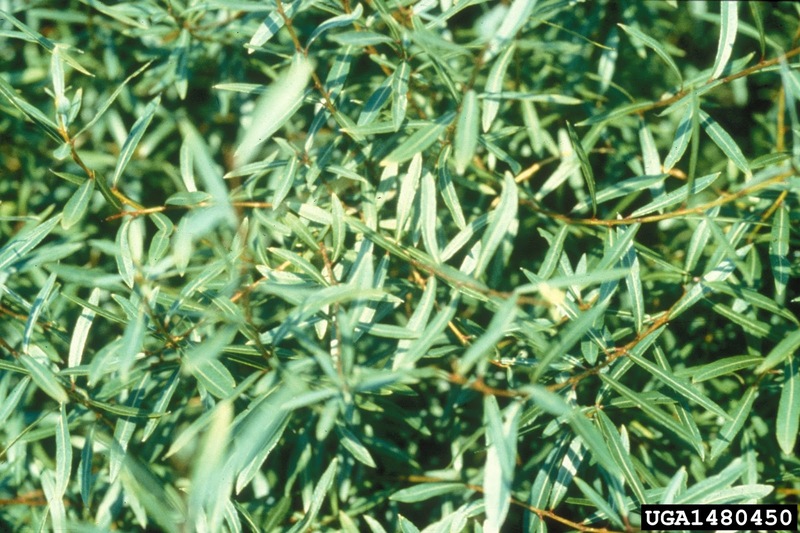 It is most common in the understory of Atlantic Coastal Forests or Sandy Coastal lands. It is considered to be one of the more hardy Palms with some specimens being 500-700 years old. It's Natural range is quite small, only covering one entire state (Florida), it then hugs the Gulf & Atlantic coasts in the far southern portions only of Georgia, Alabama, Mississippi, and South Carolina. It is now found growing in most of the South Eastern United States, especially in Coastal areas but can be found as far inland as Arkansas. Tha Saw Palmetto is a fan palm, it's leaves are made up of 20 (+/-) leaflets that originate from the petiole. The Petiole is covered with sharp teeth or spines, these spines are sharp enough to break human skin. 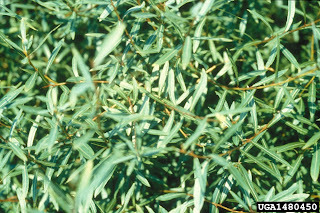 The leaves are simple in form and bright green when grown inland and a more silver-white green in Coastal areas. Leaves can range in length from 40-80 inches, and the leaflets are 20-40 inches long. The fruit of the Saw Palmetto is a reddish-black. The fruit is very high in fatty acids and phytosterols, it is edible to both humans and animals. Saw Palmetto is also used as a supplement and can be bought in pill form. The supplement is rumored to help with some forms of Cancer but this has yet to be proven by any type of FDA research. Recommended for hardiness zones 8-11. Here in Maryland, it can only be grown indoors and may only be available from your local nursery as a houseplant. 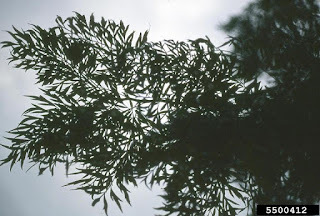 The leaves are lobed and have an almost two toned appearance, during the early growing season they are a dark green on top and a silvery white on the underside becoming green all over by the summer months. The leaves grow alternately and are coarsly toothed/lobed with variable margins. The bark is a pale grey with networks of thick course blackish grey ridges, becoming a dark grey when mature. The acorns are 1 inch long and enclosed in a warty cap, this cap often remains attached to the stalk once the fruit is ripe and falls from the tree. The Northern Red Oak (Querus Rubra) is a medium to large deciduous tree. It is also called Common Red Oak, Eastern Red Oak, Mountain Red Oak, Grey Oak or just Red Oak. It is the Northernmost growing of all the Oaks in the East, with it's native range extending to Nova Scotia. It grows from Cape Breton Island, Nova Scotia, Prince Edward Island, New Brunswick, and the Gaspé Peninsula of Quebec, through Ontario, in Canada downward into Minnesota and South to Eastern Nebraska and Oklahoma; Arkansas, continuing to dip down into Alabama, Northern parts of Mississippi and Louisiana and continuing East to Coastal Georgia and North Carolina. It is an easily transplanted, low maitenance shade tree with good form and dense foliage. It's hardwood lumber is very important to lumber production in North America, it is also used for firewood. The Northern Red Oak is the State Tree of New Jersey. Northern Red Oak is monoecious, it's staminate flowers are borne in catkins that develop from leaf axils of the previous year and emerge around the same time as the new leaves in April/May. The pistillate flowers are solitary or occur in two+ flowered spikes that develop in the axils of the this year's leaves. The fruit is an acorn or nut that occurs singly or in clusters of from two to five, is partially enclosed by a scaly cup. Northern Red Oak acorns are brown when mature and ripen from late August to late October, depending on geographic location. The acorns of the Northern Red Oak are favorited by many type of wildlife including the voles, mice, squirrel, deer, black bears, and even some birds. The bright Red fall leaf coloring of the Northern Red Oak is one reason it is added to many planned landscapes as a shade tree. In the growing season the leaves are a crisp green. It features alternating leaves that are 4–8" long and have 7–11 waxy, spine-tipped lobes each. The Northern Red Oak is recommended for zones 3-8 and is readily available at most nurseries during the planting season. The Northern Red Oak grows to a height of 60–75' with a crown spread of around 45' at maturity. Be sure when planting to plan ahead for the potential size at full maturity - always remembering to plant the right tree in the right place!